My favorite thing about cooking around the holidays is making a lot of snacks and appetizers. Our Christmas Eve always consists of a few apps and a casual, comfort food dinner. 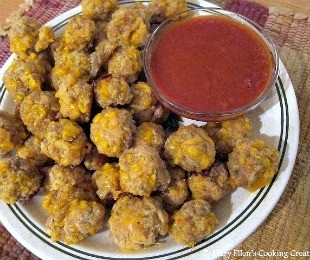 I have heard so much buzz about Sausage Cheese Balls that I had to try them. My sister and I put this together on Christmas Eve. It was really easy and turned out to be the perfect one-bit appetizer. The recipe makes a lot, but good news! They reheat well the next day. You can customize these to meet your tastes by changing the type of sausage and level of heat. Also, a lot of people serve them with a sweet chili sauce, whereas I liked serving them with a marinara sauce for dipping. However you make them, I promise you that they will disappear! Heat oven to 350ºF. Lightly grease bottom of a baking sheet. Stir together all ingredients, using hands or spoon. Shape mixture into 1-inch or smaller balls. Place on the sheet. Bake 20 to 25 minutes or until brown. Immediately remove from the sheet.